Rotary cutters will become the best friend of any quilter, seamstress, crafter and anyone who loves to work with any type of fabric do everything you used to do with a pair of scissors as they can do the work in a record of time. 1 – Olfa 9654 RTY-2/DX 45mm Ergonomic Rotary Cutter. As a quilter, you’ll love to have the Olfa rotary cutter on your work table all the time and ready to help you to cut a few layers of fabric at the same time, from one layer at the time up to six layers. Easy to operate and its ergonomic shape make it easy to work with it to cut out all the pieces of fabric you need to make a quilt no matter the size of the quilt. The blade will last for a few years as it’s made of high quality, when the time to change the blade comes, it will be easy to replace it as you can find extra blades to buy on the internet as well. It comes with one blade in the cutter, it’s very sharp and it will last long time. 2 – Fiskars 45-Millimeter Titanium Rotary Cutter. When you look for a rotary cut that can cut any type of fabric, you can be sure this Fiskars rotary cut will help you to cut any type of fabric but also it will cut on vinyl, thin leather, paper, batting fabric without any problem. The Fiskars rotary cutter blades are made with high quality. The Fiskars rotary cutter is made to fit perfectly for both, right and left-handed quilters, this will help you to cut all the pieces of fabric you need to make a quilt of any size with no problem at all. It comes with a button activated retractable blade guard for safety. It works great, precise cutting, easy to use, thin and tick fabrics can be cut with no problem at all with the Fiskars rotary cutter. 3 – Olfa 9651 RTY-2/G 45mm Straight Handle Rotary Cutter. A light rotary cutter to have in your quilting tool bag all the time as it only weights 68 g. One of the smallest rotary cutter you can find in the market, but it will work as good as the others, it can cut up to 6 layers of fabric with ease. It will help you to work with no problem at all on the medium and big size quilting projects you want to make. It comes with a durable handle and with a blade cover for safety. You will love this cutter as it cuts the fabric without much pressure, the cuts are very clean. I have had this rotary cutter in the past and it worked great all the time I used it, I will buy it again. The favorite tool of many quilters and mine too. I bought this cutter a few years ago and it still works like the first day, I can cut perfect fabric pieces, small and big every time I’m making a new quilt with it. It can cut up to 6 layers of fabric at the same time, it comes with a 45mm blade which is perfect to make any size cut on any fabric. The blade is sharp, retract it when is not in use, keep it out of reach from children and pets. It will work perfect for right and left-handed quilters. It’s lightweight, easy to hold and it cuts perfect every time you use it! 5 – Fiskars 28 mm Stick Rotary Cutter. A tool with the high quality of all Fiskars products, small and light to carry with you to your quilting and patchwork classes or on your next vacation trip. This tool is designed with a contoured to provide better comfort when you cut all those little pieces of fabric to make your next quilting project. It’s designed to be used by right and left-handed quilters. Its blade is extremely sharp, keep out of reach from children and pets. Retract the blade when is not in use all the times. This tool will be the one you’re looking for to cut all the circle pieces for your quilts. The small blade will help you to do the perfect cuts in all wonky and curved pieces. It cuts easy and smooth! Tips to use your rotary cutter safely. 1 – Don’t forget, the blade is sharp! As you work to cut all those fabric pieces you need to make your next quilt, you might forget the rotary cutter is on your work table and you left it with the blade out, it doesn’t require you’re trying to make a cut on the fabric to hurt your fingers, even the slightly touch can cause a deep cut. Always take the time to put the blade out of reach after you finish each cut. 2 – Buy the right blades for your rotary cutter. Each brand makes its own blades for each rotary cutter, don’t buy a blade because you found it on sale or because it’s cheaper. Each rotary cutter brand design and makes the right blades for each model. 3 – Use the right size. There are quilts that will require from you to cut small pieces of fabric as big pieces of fabric, when you’re working on a project where you need to cut different size of fabric pieces, cut each piece with the right size of rotary cutter. When you need to make a small cut, use a small size of rotary cutter, by doing this, it’ll make easier for you to cut the fabric the right way, when you need to cut a larger piece of fabric, a bigger rotary cutter will be the right tool to cut those big pieces of fabric. 4 – Use a ruler. Most of the fabric pieces to make a quilt will have straight lines, when you work to cut all the pieces you’ll be using to make your next quilt, use a ruler, it will help you to make the straight cut in every piece of fabric and it will also provide with a safety barrier between the blade and your hands. The right ruler to give you the protection you need when cutting fabric pieces for a quilt will be of course a patchwork ruler, they are made thinking to provide the right tool to help you to cut all the pieces you need for your next project but also they have the thickness you need to guide the rotary cutter and to provide the safety you need. Be sure you use a ruler that has at least 1/4″ thickness. 5 – Always use a mat. One of the basic tools for any quilter will be the rotary cutter, but always be sure to place a self healing mat under, it will provide protection to any surface you use while you cut all those pieces of fabric for your next quilt. A good quality cutting mat will also help the blade glide along smoothly, reducing the risk of any accident. 6 – Cut away from your body. It makes sense, never cut by pulling the tool towards you! 7 – Always stay stand. Anytime you need to cut a new piece of fabric for your quilt, stand up and make the cut. It’s always better to make the work of cutting fabric using the right tools standing. 8 – Keep the blade closed. Every time you finish the work of cutting all the pieces you’ll be using that day, close the blade. Every rotary cutter has its own system to keep the blade closed. As you keep it closed it will provide the safety you need for yourself and for your family. Never put the tool on your tools box or bag with the blade out or leave the tool on a table unsupervised. 9 – Keep the blade sharp. As you use the tool, the blade will lose its sharpness, an unsharpness blade is most dangerous than a sharp blade, as you work with an unsharpness blade it will require from you to make more pressure on it as you make a cut, by doing this, there will be more chances of a slip-up. You can avoid the risk of having an accident by replacing the blade often. 10 – Be careful when you change the blades. Take your time to read the rotary cutter package to know how to change the blade, each brand will provide you with the right instructions to do it. 11 – Discard blades safely. Anytime you discard a blade, take your time to pack the blade inside of a cardboard package made by you, so nobody can get hurt. 12 – Place the tool away from children and pets. Some rotary cutters comes with bright color and children and pets might think this tool is a toy, always keep them away from them when you’re not using them. Take care of your rotary cutter. When you try the rotary cutter for the first time after you take it out of the package, you can notice it will have a drop of oil on the blade, do not wipe it out, the oil will keep the blade working great as you work with it. It will not damage the fabric you cut and the oil will keep the blade working smooth. After you use the rotary cutter to cut a good amount of fabric, you can clean it as often as you need, to do it, you can remove the screw on the back where the blade is attached, remove the nut, remove the curved washer and the screw. Lay everything on the table and keep the pieces in the order you removed each piece, now you can remove the blade protector, clean the blade with a soft fabric with a drop of oil for your sewing machine, and pay attention to not get cut, if you want to use pliers to hold the blade you can do it. When the blade is cleaned, place a drop on each side of the blade of the oil you use for your sewing machine, and reassemble the cutter. Next time you buy a new cutter, keep the back of the package, many producers place a diagram of the cutter and give directions to clean it. When you become a quilter, you’ll be introduce to the art of cutting fabric the easiest way, and this is by using a rotary cutter. There are a few brands where you can check for their rotary cutters, you might need to try a few of them until you find the right one for you. Today quilters, we are so lucky to have the right tool to help us to cut with ease and comfort all those small and big pieces of fabric to make our quilting projects. Get this tool on your work table all the time and it will help you to save lots of time while you cut all the fabric pieces, this way you’ll have more time to sew and to do the quilting on your quilts. You might need one, two or maybe three different rotary cutters to help you to cut the different shapes, size and materials that you will be using to make your quilts. 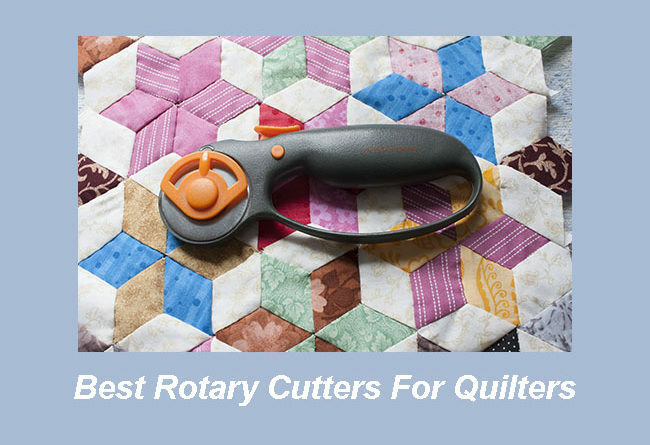 You don’t need to buy all of them at the same time, as you keep making your quilts, you’ll know your needs and you’ll find the right rotary cutter for that quilting project. Have always a couple of extra blades at home, if one blade gets in bad shape, you can change it and keep working on your quilt, no need to run to the store to get just the extra blade. Always use the patchwork rulers to cut all your fabric pieces, they are made with the right thickness to help you to be safe while you use this tool, but also they are made with the right material to protect the rotary cutter blades. Get always the right tools to make your quilts and you’ll be better and better every day! 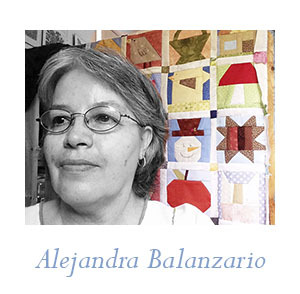 Follow me on my Social Media, so you can get the updates of my quilting adventures in Canada! You can also visit the FREE Quilting and Patchwork patterns page, I’m sure you’ll find there your next quilting project to make! Save this PIN on your Pinterest account, so you can find my blog again! Thank you for this useful post. I got a pair of rotary cutters on special when I ordered a quilting magazine once. I used them once, or at least tried to but couldn’t fathom out how to use them. Thanks for your clear explanation, and I think I am going to try again, as cutting with scissors when you have a lot of pieces the same is very time-consuming. I already have my self-healing mat, so I hope I am ready to make this work now. 1. It can cut up to 6 layers of fabric at the same time, it comes with a 45mm blade which is perfect to make any size cut on any fabric. 2. The blade is sharp, retract it when is not in use, keep it out of reach from children and pets. 3. It will work perfect for right and left-handed quilters. 4. It’s lightweight, easy to hold and it cuts perfect every time you use it! My wife does a lot of quilting during her spare time, and I know she’ll love having a new rotary cutter. You’ve listed very good rotary cutters, and all of them would offer good value for money. I’m looking to get the Fiskars 9521 45mm Contour Rotary Cutter because, you’ve said it’s the favourite by quilters. I know she will love it! Thanks for stopping today to read my blog and leave a comment. Yes, rotary cutters make easier the job to cut fabrics, as you use it, you’ll learn how to get the best of it! Is their a need for any special training on the use of the rotary cutters? What knowledge is needed to carryout routine cleaning f the cutters? Can repair be carried out on the cutters without involving a technician? How long can the cutter be put to use before a routine maintenance is carried out?. Thanks you for stopping by to read my blog today, you don’t need any special training to start using the rotary cutter to cut fabrics, but you need to follow the safety tips to be sure you will use it safe. If something happens to the cutter, you might need to get a new one, but if the damage is only in the blade, you can get an extra blade and change it by yourself, you can watch the video I’m sharing here on the blog post, the quilter gives you the steps to follow on how to change the blade on a cutter following the safety steps to do it. If you have any more questions, you can leave them on a comment. Well, I have a friend who does quilting, and I found your website as I was looking for a gift. I guess a rotary cutter would make a great gift, just the right price range for me. It would also be a nice surprise too! But maybe I was disappointed with the choice of colors?! They all look so much like tools in their orange and yellow colors! Are there other models that look a bit less like tools? Maybe I just have to get used to it. Thanks for this article on best rotary cutters for Quilters. I am into fabric cutting, and I happy to have found your site to read a review about these rotary cutters. These are better than the ones I currently have in my fabric store. I will make an order for the Olfa 9651 RTY-2/G 45mm Straight Handle Rotary Cutter because It comes with a durable handle and with a blade cover for safety. All listed precautions in handling it will be followed. Thanks for this article. You did a great job.